Flexible impeller pumps provide an efficient solution to most raw water pumping needs. The pumps are self-priming and can pass fairly large solids without clogging or damaging the pumps. Designed for a number of applications on board (cooling water pumps for marine engines, bilge pumps, deck wash pumps, fresh water pumps, fuel transfer pumps and other applications). With an electro-magnetic clutch you will have pumping power whenever needed, at a push of a button, without being at the pump. 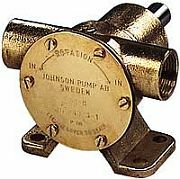 Combined with a vacuum switch from Johnson Pump (recommended for bilge pump application), the clutch will automatically disengage whenever the pump starts priming air, thereby preventing dry running and pump damage.